The bullhead (Cottus gobio L.) was for the first time recorded in the Utsjoki River (70° N, 27° E), a large tributary of the Teno River (Northern Finland), in 1979 and in subsequent years spread widely within this lake-river system. The studies of 1993 and 2007 allowed the general trends of changes in the bullhead mass parasitic species composition and incidence over the examined time period to be estimated. It was shown that the species diversity of the parasites of this species new to the fish community did not change considerably except for a noticeable increase in the infection rate with larvae of the trematode genera Diplostomum and Apatemon. In general, the incidence rate and distribution of the plerocercoids of Schistocephalus solidus, a mass helminth species, in the bullhead population did not change. The observed increase in the infection rate of the Atlantic salmon parr with Apatemon gracilis metacercariae may be regarded as a consequence of the bullhead invasion. Original Russian Text © E.P. Ieshko, B.S. Shul’man, D.I. Lebedeva, Yu.Yu. 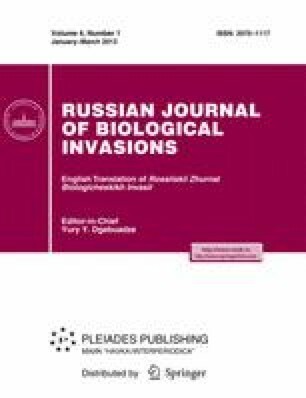 Barskaya, E. Niemela, 2012, published in Rossiiskii Zhurnal Biologicheskikh Invasii, 2012, No. 3, pp. 28–37.